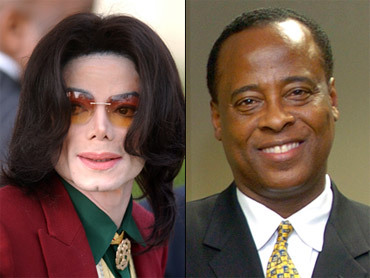 Michael Jackson's personal doctor will be charged with manslaughter in the late singer's death, according to FOXNews.com. Dr. Conrad Murray will be arrested within two weeks - and possibly as soon as next Wednesday - according to the report, which cites an anonymous law enforcement source. Investigators will likely execute another search warrant - possibly at a Los Angeles pharmacy - the report says, as they try to build a case that Murray's treatments led to the pop star's death in June. Murray reportedly gave the entertainer the powerful anesthetic propofol to help him sleep hours before his death. FOXNews.com also reports that Jackson's dermatologist, Dr. Arnold Klein, will face charges related to medical malpractice. His arrest will not come for another two weeks, according to the report. On Tuesday, Murray posted a YouTube video thanking his family and supporters, saying that he was "afraid to return phone calls or use my e-mail." Authorities were weighing whether to offer Murray the chance to surrender in Los Angeles or arresting him in Houston, where he currently is staying, according to the FOXNews.com report. Meanwhile, the King of Pop is set to be buried Aug. 29 - what would have been his 51st birthday - at Forest Lawn Memorial Park. Jackson biographer J. Randy Taraborrelli said the entertainer's family has been fearful of somebody kidnapping or vandalizing the body. But Forest Lawn is a private, gated cemetery where "fans will never be able to make a pilgrimage to Michael Jackson's crypt," reports CBS News correspondent Hattie Kauffman.